Incredibly quiet sleek and energy-efficient ductless split systems are the smart way to cool rooms without ductwork—even those without windows or exterior walls. 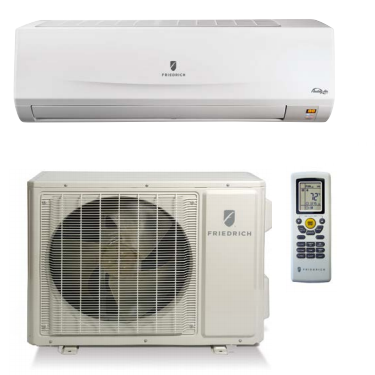 Inverter Technology Inverter technology allows each system to adjust capacity and cooling output to provide only the amount of cooling needed at a given time. DiamonGold Advanced Corrosion Protection Protects the outdoor coil against deterioration and extends the life of the unit especially in harsh coastal environments. Low Vibration Twin Rotary Compressor Friedrich's twin-rotary compressor has a unique design that reduces vibration for lower sound levels outdoors. Ultra Quiet An electronically controlled cross-flow fan creates an ultra quiet' yet powerful air flow into the room. Optimum Air Flow Air is directed downward in heating mode and angled upward during cooling mode so the room feels more comfortable' faster.